MINNEAPOLIS — Iowa’s new arrangement went unannounced and unnoticed until 30 minutes before kickoff on Saturday. An offensive line under fire for failing to consistently protect star quarterback C.J. Beathard quietly shuffled its five starters to face Minnesota. And the rest of the Hawkeyes saw immediate results. Iowa (4-2, 2-1) rushed for 179 yards and allowed just one sack in Saturday’s 14-7 win over the Golden Gophers at TCF Bank Stadium. The major pregame move shifted senior Cole Croston from left tackle to right tackle. Deflecting talk of a demotion, Croston smiled when Wadley’s comments made their way out of the interview room. “We try to keep an even-keel,” Croston said. “Hopefully what Akrum was seeing was aggressiveness out of us, because we want to be aggressive out there. Sure, we want to move guys. I think that’s nice for him to say. Sending the Sergeant Bluff native to the opposite side knocked down two more dominoes. Left guard Boone Myers reclaimed his old spot at left tackle, while regular right tackle Ike Boettger moonlighted in at left guard. Center James Daniels and right guard Sean Welsh stayed put for the third straight week. The group settled in quickly against the Gophers (3-2, 0-2). “It was very positive when we talked earlier in the week,” Myers said. “This is what the coaching staff wants, this is what we’ve got to do, and we’ve got to get our jobs done. Offensive line coach and run game coordinator Brian Ferentz was credited with the move and motivation that sparked the struggling unit. 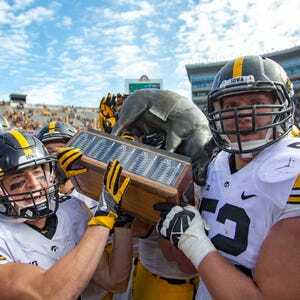 Iowa allowed six sacks and rushed 41 times for 79 yards last week against Northwestern, when Big Ten Conference hopes seemed to be fading. The reconfiguration — Myers, Boettger, Daniels, Welsh and Croston from left to right — and response came at the best possible time. Beathard still took a few tough hits in the pocket and pitched two interceptions. The run game struggled at times to establish an edge on Minnesota’s speedy defense and outstanding linebacker Jonathan Celestin. But Wadley was able to breakaway for a 54-yard go-ahead touchdown because of the physical play the line brought back after a month of small gains. Iowa head coach Kirk Ferentz was pleased by the performance, too. The win was Iowa’s fourth in the last five years against its northern rival. The unit was more understated about their adjustments than their teammates. Surrounded by cameras under the stadium, the linemen were focused on keeping Floyd of Rosedale and the West Division work ahead of them. Perhaps James Daniels could shed more light on the shifts? As a stabilizing force in the middle, surely he saw how the changes unfolded around him. “I couldn’t tell the difference,” Daniels added curtly. But the difference was noticeable on TCF Bank Stadium’s soft turf and scoreboard. Iowa’s offensive line is a puzzle whose pieces fit on Saturday. “Playing right tackle for me wasn’t a big deal,” Croston said.